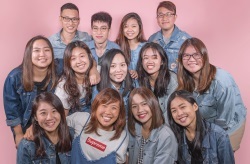 If you hate being caught in a “paiseh piece” situation, where you and your dining companions are begging each other to take the last piece, then Yàn will be the perfect Chinese restaurant for you. Here, dishes are all artfully plated into individual portions by the lovely waiters, so you never have to worry! 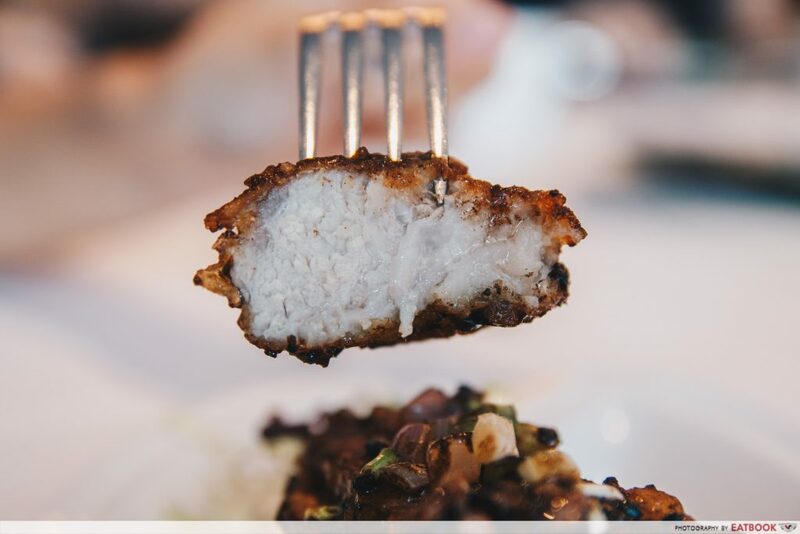 Now, before you go thinking, “Ah, yet another modern Cantonese restaurant”, you will be glad to know that the dishes served at Yàn are far from this. Instead, they are kept simple, and tie back to traditional recipes and ingredients. 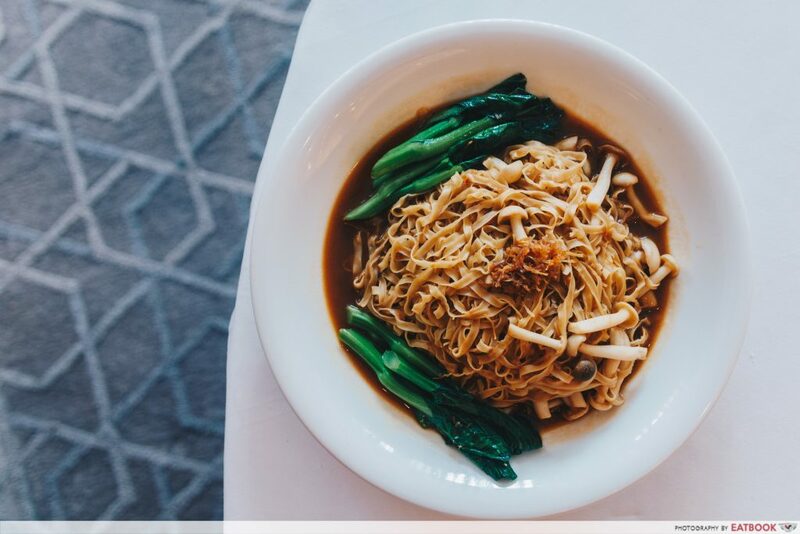 Taking over the reigns of the kitchen is ex-Crystal Jade group executive chef, Chef Lai Chi Sum, who brings about dishes steeped in history to the table. 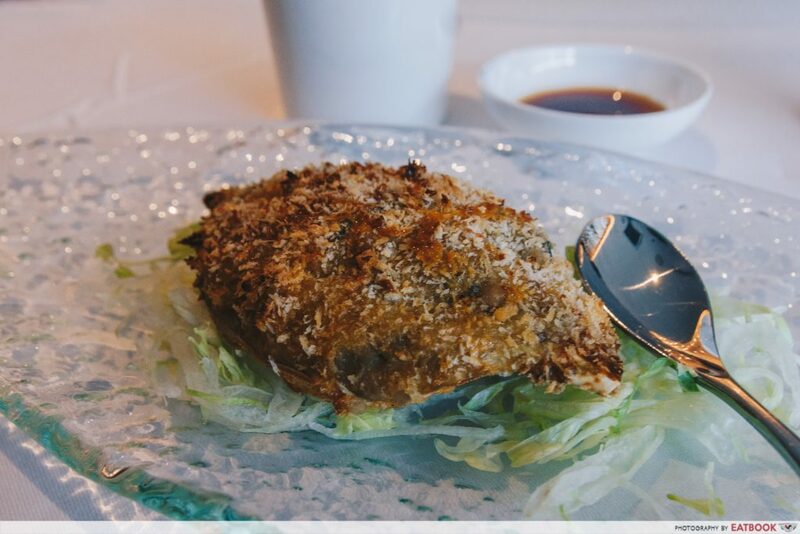 Take for instance the Baked Crab Shell with Crab Meat with Onion ($18++ per serving). 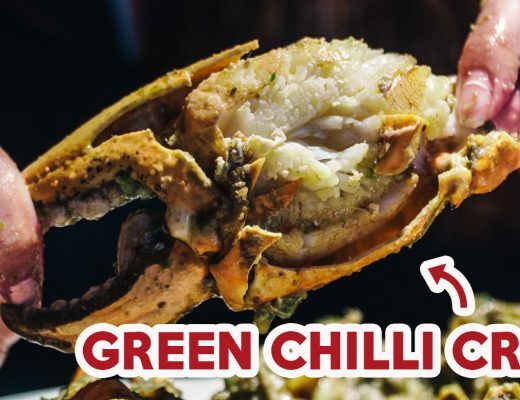 While this crustacean dish seems very ang moh, it was actually created by Hong Kong chefs to attract foreign businessmen to dine at their restaurants during the country’s economic boom. Staying true to the original recipe he learnt back in the early ‘80s, the dish is a painstaking one to make. 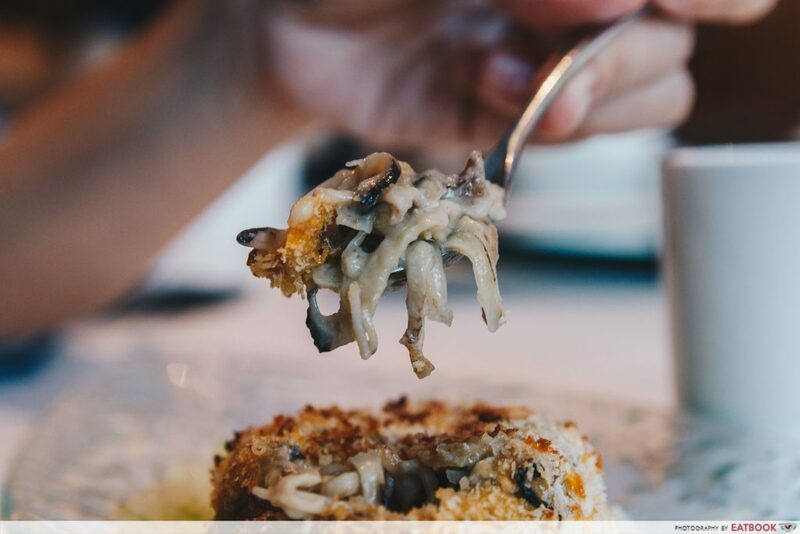 First, it has to be steamed, before the flower crab’s flesh is removed and sautéed in bechamel sauce, chopped onions and fresh mushrooms. After which, it is covered in breadcrumbs then baked in high heat. The end result is a crusty layer that breaks to reveal a creamy filling. It was a decadent treat, although I did find that the bechamel sauce took too much spotlight away from the sweetness of the crab. Another nostalgic dish on their menu is their House Special Baked Pork Ribs with Black Olives ($13.80++ per serving). Back in Guangzhou, black olives were a prized ingredient among farmers. In fact, even until today, it is one of the “four treasures of Zengcheng”. Lightly marinated in salt and pepper, the massive Australian pork rib was succulent, without being too dry. 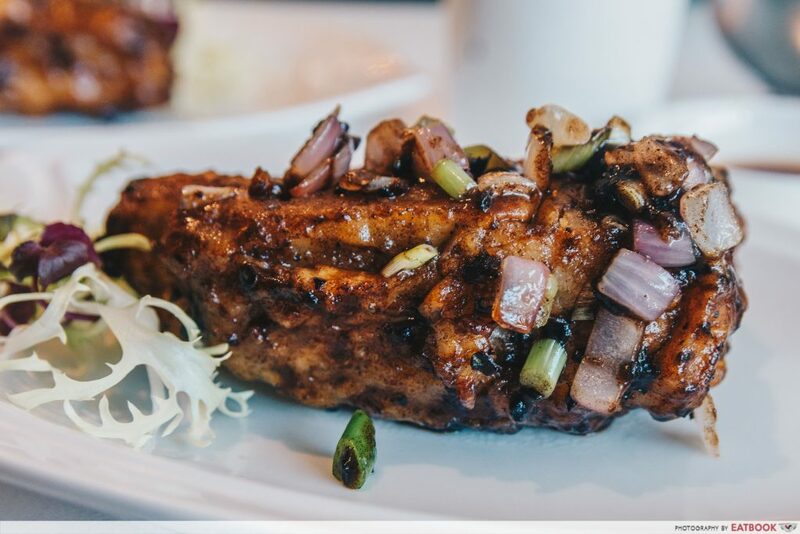 The sauce, which is made from Teochew preserved pitted black olives, plum sauce and honey, gave the dish a welcoming saltiness, while the red onions and shallots added a sharp bite. Of course, one must not visit a Cantonese restaurant without trying their roasted item. 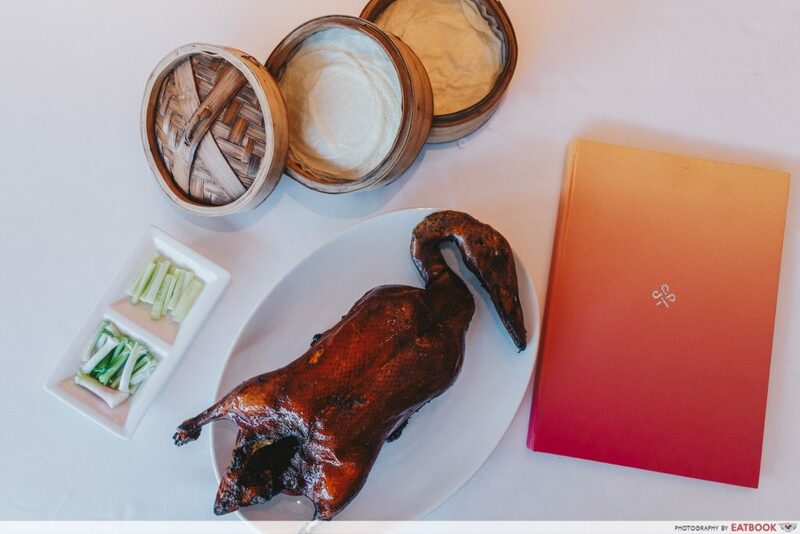 And my colleague and I had the pleasure to try their Yan Peking Roast Duck served with Homemade Crepe and Traditional Garnishes ($45++ for half, $90++ for whole). 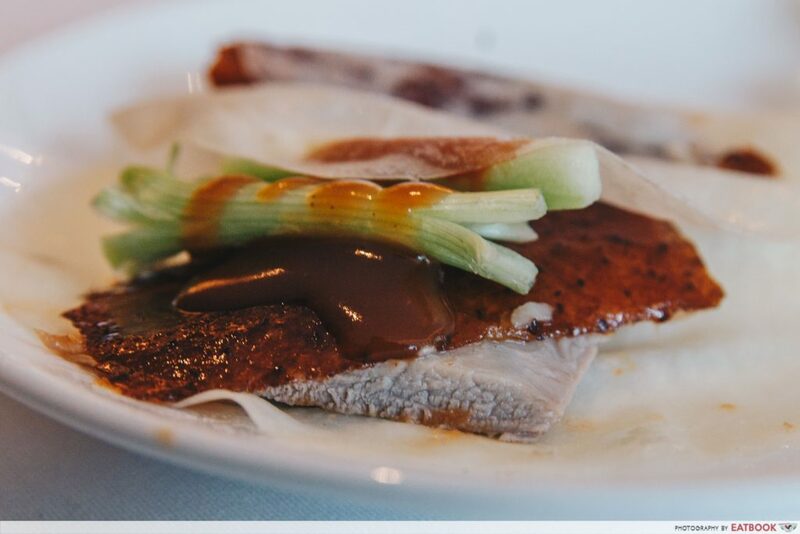 The duck meat was tender and boasted a paper thin, crispy skin. What really made this dish special was the tantalising plum sauce, with its deep fruity note that was sweet and slightly tangy. 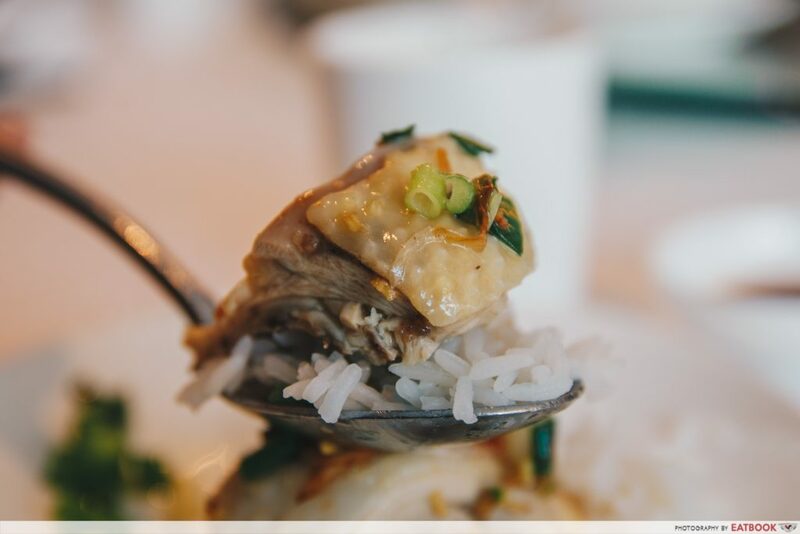 For an additional $10++, you can request for any leftover duck to be stir-fried into fried rice or noodles. 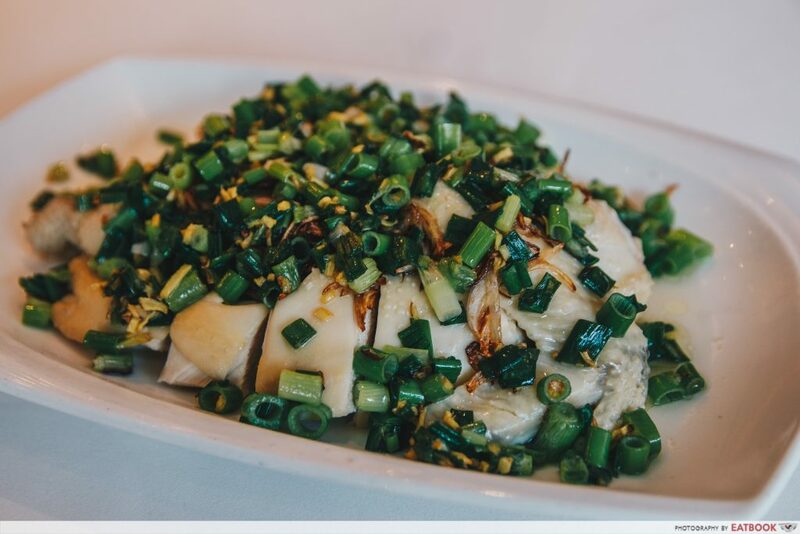 While it looked simple, the Steamed Kampong Chicken with Ginger Spring Onion ($25++ for half, $50++ for whole) was actually a really tasty dish! This was thanks to the accompanying chopped ginger and spring onion that were fried in scallion and peanut oil. The savoury garnishes elevated the taste of the tender steamed chicken, and the spicy tang from the ginger made it even more appetising. It’s best to have it with rice, as it may be a tad too salty on its own. We rounded up our meal with their Braised ‘Mee Po’ with Fresh Mushroom and XO Sauce ($22++ for small, $33++ for medium, $44++ for large). 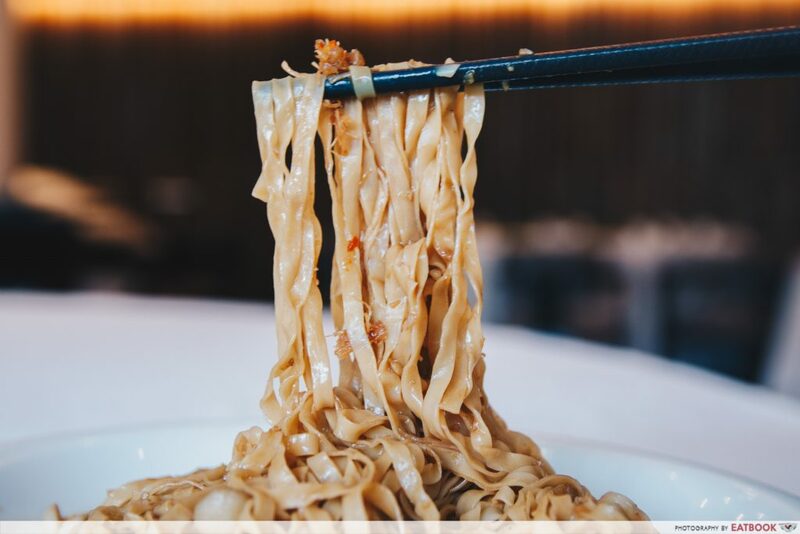 Thoroughly coated in their house-made XO sauce, which apparently comprises more than 20 ingredients such as dried scallops and shrimp, salted fish, ‘Jing Hua’ ham, prawn roe and chilli, slurping up the al dente noodles left a delightful warm feeling that did not leave our tongues burning. Desserts are kept simple, with items such as Chilled Mango Cream with Sago and Fresh Pomelo ($8++) and Hot Walnut Cream ($8++). 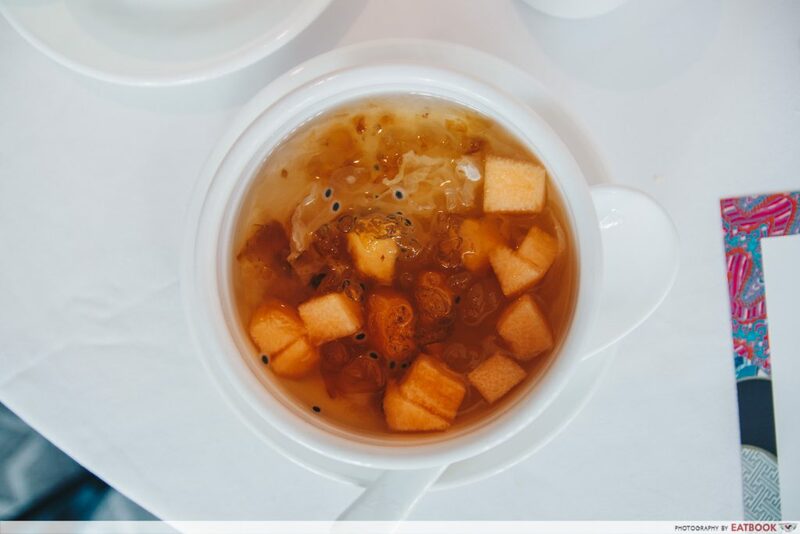 Initially, I didn’t expect to like the Chilled Peach Resin with Diced Honey Dew ($8++). But I really enjoyed the refreshing sweetness from the chilled dessert; the flavours reminded me of cheng tng. 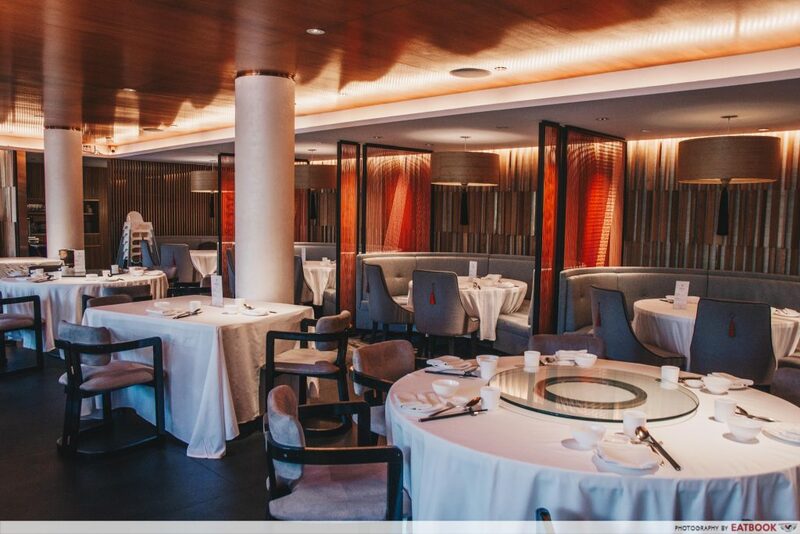 I always had the impression that Yàn was super atas, where dining there would comprise lowered voices, muffled chuckles and stiff dining etiquette. But it is far from that. 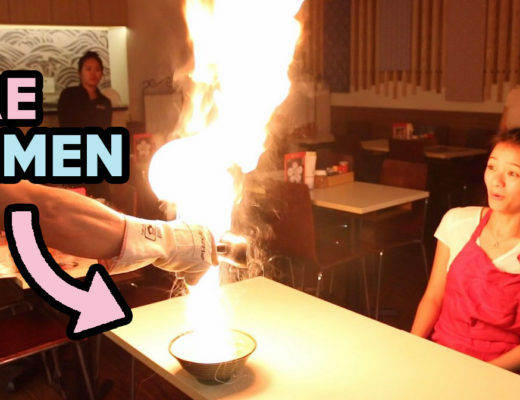 Instead, there was laughter booming across the restaurant and diners were sincerely having a good time. As it’s tucked away on the fifth floor of National Gallery Singapore, you can expect the interior to boast hints of artistic elements. For instance, partitions separating the cosy booth seats are inspired by silkweaving, and hanging off the ceiling where I was seated were 400 hand-blown glass pieces. The Cantonese dishes were not over the top, and made me feel like I was eating food cooked from the heart. 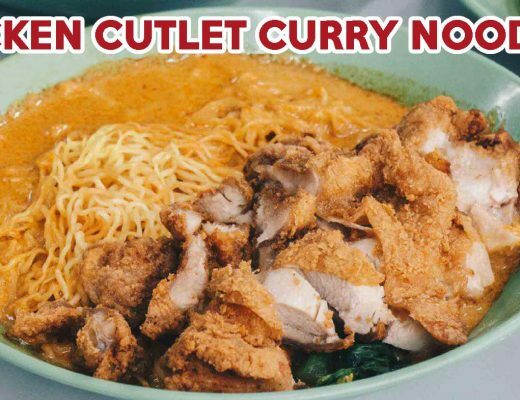 It’s more affordable if you come for their lunch special – it’s $38++ per person (minimum two to dine) and comes with five courses. In fact, I wouldn’t mind reserving their tables for next year’s Chinese New Year reunion dinner, provided it’s not already filled up! For more Cantonese fare, check out Mui Kee Congee from Hong Kong, or Tonny Restaurant, which is an old-school Chinese restaurant near Kallang. This was a media tasting at Yàn.